This is le roi des salades. It will make you forget every depressing time you ordered a house salad instead of a cheeseburger. Our version is a fairly straightforward rendition of the classic, accessorized with shaved radishes, thinly sliced chives, and a little bit of piment d'espelette, a delicate French chili powder (cayenne works just fine). Poaching eggs is a little intimidating/mysterious, but it's way easier than it looks and the fastest way to get perfectly runny yolk. It really only takes one or two tries to master the ~method~ of plopping an egg in the middle of a vinegary vortex. Try to find slab bacon for this recipe--it's nice to cut the lardons extra thick so they provide a strong contrast to the delicate vegetables. But don't worry too much; we guarantee no one will complain as long as it's smoky and crisp. 1. Fill medium saucepan with water. Add white vinegar and bring to a simmer over medium heat. 2. Sauté bacon in small saucepan over medium heat until browned and crispy, about 10 minutes, stirring occasionally. (A good trick is to cover the saucepan to start so that the moisture stays in the pan and helps the fat to render.) Remove bacon from pan with slotted spoon and drain on paper towels. 3. Pour off bacon fat. Add water to pan and raise heat to medium high. Bring to a boil and simmer until thick and syrupy, about 2 minutes, scraping the pan with a wooden spoon to deglaze. Remove from heat. 4. 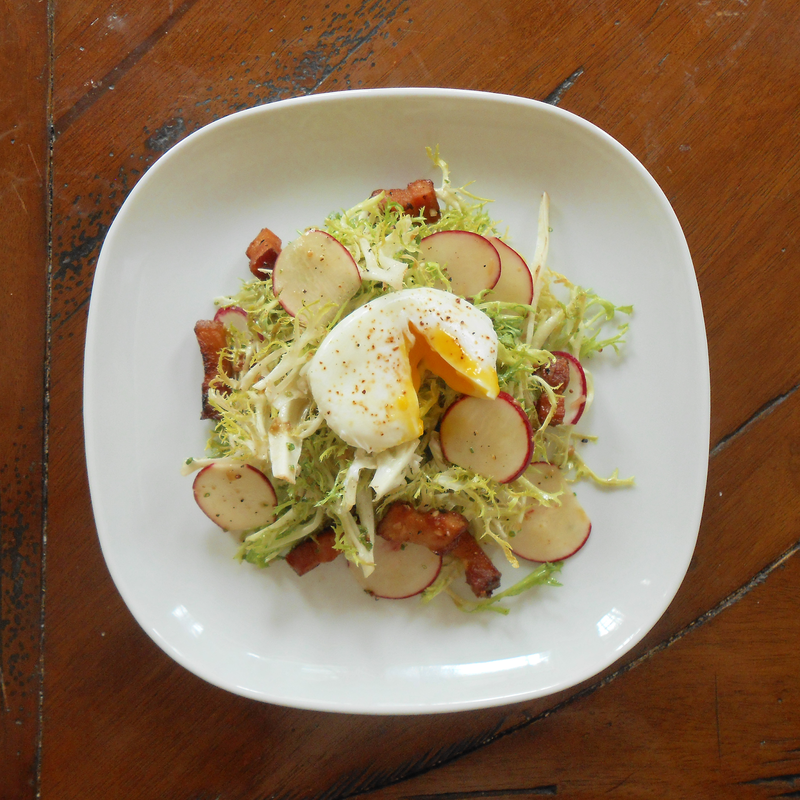 While the bacon crisps, trim dark green edges and hard white core from frisée. Feed trimmings to your pet rabbit. Rinse in cold water and spin dry or pat dry with paper towels. 5. Whisk together deglazing liquid, sherry vinegar, shallot, and mustard. Slowly drizzle in olive oil while whisking. Season lightly with salt and pepper (taste with a leaf of frisée or a slice of radish to check seasoning). 6. Crack eggs into ramekins. Whisk simmering water until a strong vortex forms in the middle. Immediately add both eggs to simmering water. Poach until whites are set but yolks are still runny, about 2 minutes. Don't let the water boil. Remove eggs from saucepan with slotted spoon, shake very lightly to remove excess water and any flimsy bits of white, and set aside on a plate. 7. 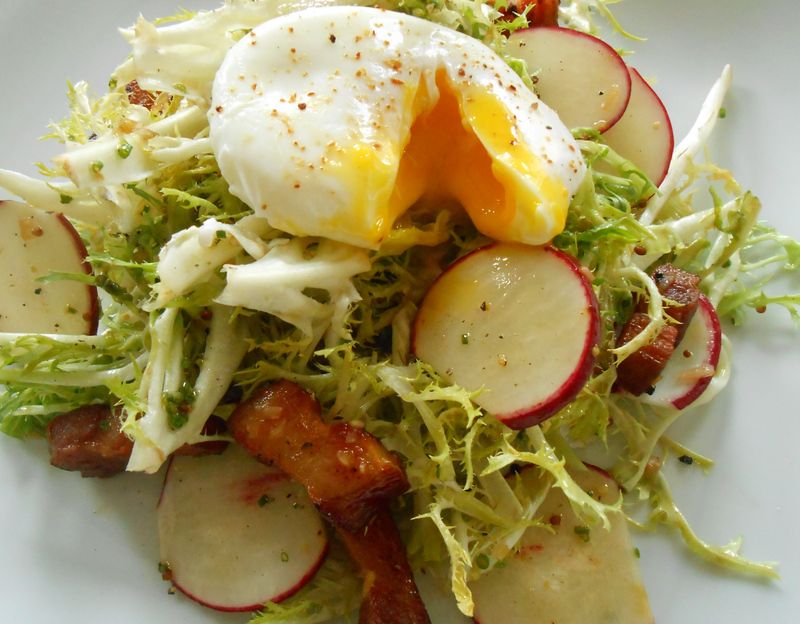 Toss frisée, radish, and chives with vinaigrette. Arrange salad on two plates. Top each portion of salad with an egg. Lightly sprinkle eggs with piment d'espelette. Serve immediately. Encourage guests to "ooh" and "aah" when they cut open their eggs.